Shoulders look strong and masculine in this harness made for the most powerful men. 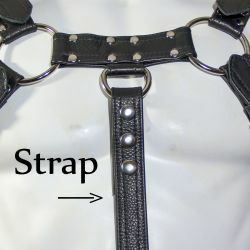 3.5-inch D rings and wide shoulder straps create a harness that frames the biggest guys perfectly. The Wide Shoulder harness adds extra leather and hardware to shoulders. It's a weighty piece that feels incredible and really enhances that "strongman" vibe. 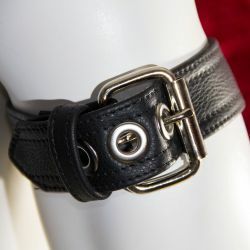 The dramatic 3.5" beveled D-rings are connected by 3.5"wide leather straps across the top of the shoulders. 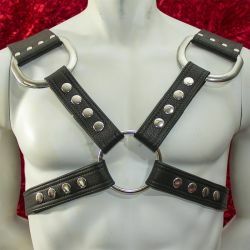 , giving this harness a pleasurable heft and a playful "gladiator" inspired look. We use the first quality, back portion of the hide, to make our harnesses. Constructed from a double layer of leather, our focus is on ensuring that our gear feels amazing against the skin. Double stitching minimizes stretching, but still allows the straps to perfectly mold to your body with wear. Given proper care, this harness will last you a long time. Provide a couple of basic measurements when you place your order, and have a piece made just for you. Large durable metal snaps allow for adjustment over time. No additional charge for larger sizes. The hardware in this piece is only available in silver. You can use the Visualizer to browse looks. Made with the highest care from our workshop in Las Vegas, Nevada.